On Hang, its first full-length album in nearly a decade, Lagwagon sharpens its songwriting skills to deliver what is arguably the group’s best album yet. The record shows an introspection and maturity, including songs about social causes. Singer Joey Cape discussed the band’s approach in an email interview. What first compelled you to sing in a band? Originally I was a drummer. I moved to guitar when the drums became too much to cart around, I suppose. (Ha!) Later, I was the guitar player in a band called Chemikill with a singer that was a difficult. The band was in the middle of making a demo. We were on the clock in a studio and singer kept showing up late. One day we called him on it and he freaked out and quit. The engineer suggested that the bass player and I try to lay down vocals. The bass player gave it a shot and it was cool but not quite right. I wrote the songs so I had a small advantage. After that I was the singer but honestly not by choice. It took some years to get used to the idea. The band’s popularity soared in the ‘90s. Were you ever close to signing to a major label? Not really. They expressed very little interest in us. I consider us lucky there. Most of the bands I knew that made the jump to a major had major problems a year or two later. Do you regret not signing? Absolutely not. Fat Wreck Chords is such a great label. We have had the smoothest ride possible. Fat Wreck has always been accommodating. There was never any reason to leave. How have lineup changes affected the band? Those are always difficult periods. You have to rebuild chemistry in every sense of the word. For the most part the band grows from the change ultimately. Although, admittedly, there were a few hiccups or misfires in there. Talk about your approach on Hang. What did you want to achieve with the album? I wanted Hang to represent the current state of the band. 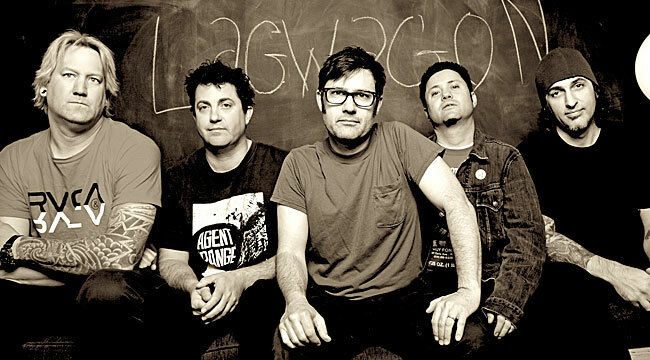 It was the most collaborative album to date for Lagwagon. In the past I generally brought songs that were completely arranged to the table. This time we spent far more time developing the songs together. I think there is a more cohesive feel to the record for that reason and because of the lyrics. I have always written lyrics to an album one song at a time. A song’s lyrics would be influenced by whatever issue or trauma was happening at that time in my life. With Hang I decided to write an album with central themes throughout. I wanted it to be slightly conceptual. I decided to write the lyrics about the counterparts of an overall observation of the world I live in, the world my daughter has to live in. I wrote most of the lyrics at the same time, which was far more difficult but challenging and rewarding. What took you so long to follow up 2005’s Resolve? Sometimes it takes years to figure out what the collective identity of our band is. The band evolves, of course, but each individual member also evolves and usually in different directions. I can never successfully write without somewhat knowing what makes sense to the band. I think the long period between Resolve and Hang is the reason the album was ultimately such a collaboration. We have always decidedly not forced these things. It’s easy to fall prey to calculation when you rush the muse. I have notice that sometimes bands that I like will follow up a record I love with a very similar record within a year or two. That prompts the question, why not just continue listening to the previous album, especially when I thought it was better? The downside of taking so many years between albums is, of course, losing momentum but, I can safely say that we have always made records that represent us well and integrity and conviction are there. I am very proud of this and still think it seems worth the wait in retrospect. The opening track “Burden of Proof” is a rather mellow, acoustic guitar-driven tune. What inspired it? Religion. As did the following track, “Reign.” I find the lack of accountability people of faith are willing to have disturbing. We create all of our problems and it seems we can forgo the guilt. Faith can absolve us of any responsibility for our actions or lack thereof. Whatever tragedies we incur can be written off as God’s will. Grand design can be a grand excuse. Many people find comfort in the belief that we are here temporarily and have some place to go in afterlife. They believe there are larger forces then nature. Too many see a reward in following the party line or chosen doctrine in unwavering faith without questioning the repercussions or consideration of their actions. So many believe they can not have happiness or even compassion and practice good deeds without help from their faith. I rarely see evidence of the modern-day Good Samaritan. It is less and less important for us to coexist and have empathy. Especially if the faithful believe there will be salvation for their dedication alone. In their lifetime and of course their offspring’s lives, diminishing land and resources will bring more conflict. Sadly, the worse things get, the more the faithful will see a confirmation of their God’s will and they may be righteously justified in their fears and their actions. They may find apathy rather then empathy. They may react with worship rather than good will. It’s a conflict of interest and a complete disregard for our children, other species and our planet’s future. There is an arrogance and condemnation built in to the belief that you will be saved. So why should they care? Any argument or debate seems futile when it ends with the burden of proof. Science and history give us more tangible facts to consider and learn from and ultimately more compassion. I love the way a song like “The Cog in the Machine” sounds like it could be a heavy metal tune from the ’80s. Talk about the song a bit. That was the most collaborative effort on the album. It was the last song we worked on and we built it together from the ground up. Everyone in the band contributed a riff or something substantial to it. In some ways I think “Cog” is our true core sound. I can see that when we play it live. It makes us all happy. “Obsolete Absolute” has to be one of your more epic tunes. What’s the story behind it? The lyrics refer to the inevitable obsolescence that comes to all machines, traditions, languages and living creatures with age. The typewriter, which we used for the intro, being a prime example. So many of the things we come to depend on mark moments in our lives. They are historic time stamps and represent the world we learn and know. It is natural that things disappear but as you grow older the process becomes more and more humiliating and desensitizing as they are also forgotten. As we become weaker or more vulnerable with age we gain wisdom but knowledge also is taking from us by the insatiable thirst for ever faster change. We are left with less relevant wisdom to pass on. It makes me sad that in my lifetime we are clearly moving away from a world that honors, respects and learns from our elders and history. On a lighter note, the voiceover listing things that are arguably obsolete is by our guitar player Chris Flippin. He is a giant. “Western Settlement” is terrific too. What is its message? “You Know Me” requires some heavy-duty singing. Was that a hard one to pull off? Actually, that one is pretty easy. “Reign” and “In Your Wake” are the voice killers on the record. What have your set lists for the tour looked like? A mix of all our records and six or seven from Hang. The band’s had a terrific run. What keeps you going? As long as we are still passionate about what we do or able to we will continue. There is ebb and flow and enthusiasm comes and goes. When we hit those lulls, we wait them out rather then break up. There was almost the beginnings of a limerick in there. Is punk rock alive and well? For me? Philosophically always, but those words have a variety of meaning to me musically.